Kristina Mathis '18 is the second Big Green player ever to qualify for the NCAA DI Women's Tennis Singles Championship. Mathis began playing tennis at age five. Her father had been around tennis all his life, and both of her parents served as her coaches prior to college. She began playing competitively shortly after, eventually ranking 23rd on TennisRecruiting.net. As Mathis explored options for college, family friends introduced her to Dartmouth. After visiting, she thought the community was the perfect fit. Joining the Dartmouth tennis team was a significant transition. Mathis had been homeschooled and had never formally been a member of a team, instead spending her junior years playing in singles individual tournaments. She explained that being on a team gave her “a whole new fondness for tennis” and made her understand that tennis was much more than just the final outcome. Mathis had an immediate impact her freshman year, finishing 14-6 at the No. 3 singles position and 13-6 at the No. 1 doubles position. She was named All-Ivy First Team for doubles and the Most Improved on the team. She was awarded the All-Ivy First Team in doubles again her sophomore and junior years, and ended up becoming part of the first Big Green duo, along with partner Taylor Ng ’17, to qualify for the NCAA Doubles Tournament. During her junior year, she helped lead the team to a share of the Ivy League Title, the Big Green’s first since 2011. As a senior, Mathis has taken on a more care free approach for each of her matches. With this new mindset, Mathis’s final season was arguably her best. As a stalwart at the No. 1 singles position, she went 23-13 overall and 12-7 in dual matches. She went 6-1 in Ivy League play, including a tough four-match winning streak to end the regular season. Finishing the year ranked 107, her stellar singles play allowed her to qualify for the 2018 NCAA Singles Championship, which will be held from May 23 to May 28 at Wake Forest University. In addition to singles, Mathis also played at the No. 2 doubles position with teammate Racquel Lyn ’20 for most of the year. As a result of her impressive play throughout the season, she was named the Ivy League Player of the Year as a unanimous selection and earned a spot on the first singles team. A key to her jump this final year was the culmination of her continual improvement on the tennis court. Head coach Bob Dallis noted that it was very easy to coach Mathis and that she was always willing to further develop her game. From a technique standpoint, Mathis has improved significantly in two separate areas. In addition to her stellar play this season, Mathis has also grown in her role as one of the team’s captains. As Mathis wraps up her career on the Dartmouth tennis team, Dallis explained that he will always remember Mathis for her overall calmness. Following college, Mathis will be working full-time next year before applying to medical school the following year. She unfortunately will not have the time to continue playing competitive tennis, but hopes to keep playing tennis for fun. Despite leaving tennis professionally, Mathis will always remember Dartmouth tennis for instilling in her a deep passion for the sport. 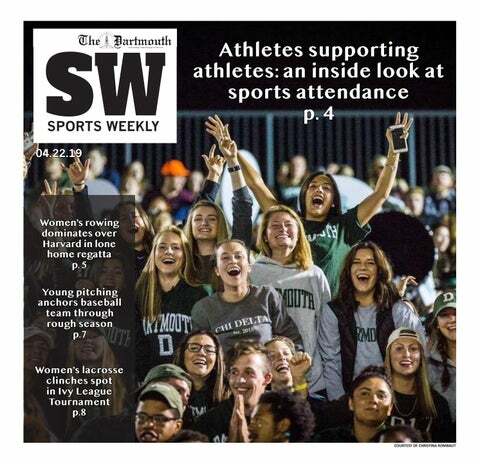 “Dartmouth tennis has helped me develop a love for tennis that made me realize just how amazing the sport is, and [appreciate] the people who have been around me all my life for tennis,” Mathis said. Lyn is a former member of The Dartmouth.